Editor’s note: At the end of the first two Philadelphia Union seasons, we posted a series of end of the season reviews of every Union player. Over the next several weeks, PSP continues with a review of the 2012 season. Taking a young player who is still coming into his own and shifting him to a new position could be recipe for disaster. But for the Philadelphia Union’s Amobi Okugo, the move from midfield to center back in 2012 was not only a success, it produced his best season in a Union shirt. Along with his partner Carlos Valdes, Okugo’s performance was one of the few bright spots during an otherwise disappointing season for the Blue and Gold. The first two season of the Union’s existence saw Okugo getting on the pitch in fits and starts, mainly at his preferred defensive midfield position. After Peter Nowak’s systematic thinning of the squad, Amobi was thrust into the center of defense. As he quickly grew into the position, the Union fans finally got to see his skills on display for an extended stretch of time. Not only did he excel, he grew right before out eyes. Amobi was named PSP’s Player of the Week after a late September 3-1 win at home against the Houston Dynamo. It was an honor he had earned, as he played a great match not only that night, but was one of the few guys who continually showed up during the Union’s slump that preceded the win. The two games against the New York Red Bulls. It is a bitter pill to swallow, but the Energy Drinks are the Union’s bogey team right now. Okugo seriously struggled against New York’s forward corps, especially the brick wall with legs that is Kenny Cooper. Also, probably on a more person level for the player, Amboi missed out on the Olympics when the men’s side bowed out in the group stage of qualification. Not getting that once in a lifetime chance to represent your country had to have been a blow. Speed, balance, calmness on the ball. 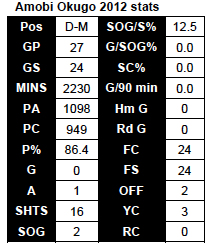 If you go back through the mlssoccer.com chalk boards you will find some excellent passing stats for Amobi. He became one of the better distributors out of the back during the year, a skill that will serve him well when he likely returns to the midfield next season. Also, his concentration and decision making both improved this season. If there was one knock on Amobi’s game, it was he seemed to have mental lapses and not track his man properly. That flaw was pretty much gone this year. Inexperience. He is a young guy still coming into his own, still putting together his game, still learning on the job. That takes time. Also, one would like to see him improve his shot taking. This wasn’t really an issue in 2012 when he played defense, but when he moves back to the midfield a strong shot would a nice arrow to have in his quiver. I’m not going to call 2012 a break out year for Amobi Okugo, it was more like his arrival. He was given a chance to play and he played very well, even if it was out of position. Signs are pointing to Bakary Soumare being healthy for next season. If that is so, he will slot into the center back spot along side Valdes. This will hopefully put Okugo in his rightful spot in the middle of the park. And we will likely see a true breakout performance. Did you mean Kenny Cooper? Not Kenny Miller.